Melbourne “Mel” Murray Sr, beloved husband of Virginia for 63 years, entered peacefully into eternal life on January 9, 2019 surrounded by his family. He was born December 12, 1925 to the late Archie and Beulah Murray. He was a devoted son, father, brother, grandfather and dear and faithful friend to all who knew him. 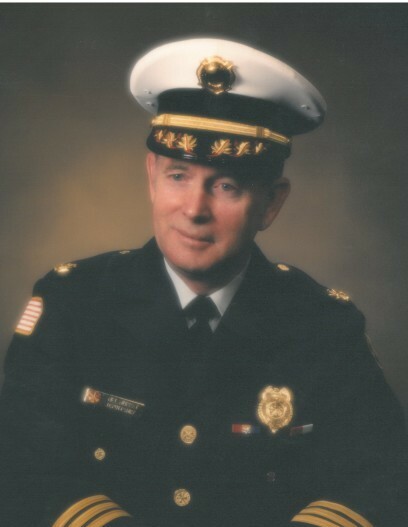 Dad was a fire fighter for 37 years, retiring as a deputy chief. He loved his job and was a great believer in giving his best at whatever he did. He wore his uniform with honor and respect and had this attitude reciprocated by his colleagues. He served in the US Navy from 1943-1945 as an airplane maintenance mechanic in Maui (AMMI2C). Mel is survived by his five children, Starlyn (Geurts), Mel Jr. (Debra), Mike (Debbie), Mark and Tracy; three granddaughters, Danielle (Clint), Andrea and Hayley; grandsons, Kelly, James (Megan) and Nick; great-grandchildren, Marley, Marek, Michaela, Mason, Tavyon, Royal and Elie. He was preceded in death by his wife, Virginia; brother, James; Gaynel (Burnette) and granddaughter, Jennifer Murray. Mel’s children are thankful to have been a part of his life. May he rest in peace in the arms of Virginia, his parents and his great granddaughter. A special thanks to Mike Murray for all the time spent at Dad’s side and to Tender Heart Hospice for all the care they provided. Services were held privately as per Mel’s wishes on January 16, 2019. Expressions of sympathy, memories and photos may be shared with Mel’s family on his tribute page at www.lyndahl.com.